In May I ran a tea-tasting afternoon with friends at college. Lots of people chipped in to help, loaning teapots and cups and kettles of water. 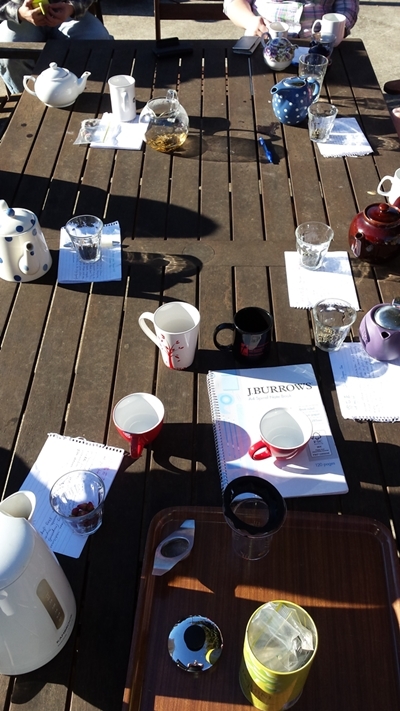 It was a really fun couple of hours, with about 20 people dropping by to try the seven teas I provided. In recent weeks I’ve given an introduction to Chinese tea in general and to different types of Chinese teas (including scented, flower and herbal teas). Now I’m going to introduce you to these seven specific teas. Some people at the tea-tasting-party had tried many Chinese teas before, while for others it was a first time experience. There was a lot of discussion about what everyone thought of the different teas; there was talk about flavour and aroma and the look of the leaves. My favourite part of the afternoon was hearing all the different favourites – pretty much every tea was someone’s favourite. A tea that one person really disliked would be someone else’s favourite. All in all it was a lovely, relaxing time outside in the afternoon sun. Xihu Longjing tea from Hangzhou – dry leaves, steeped 10 minutes, steeped 20 mintues, and the leaves after steeping. “Guanyin” is the Chinese name of a Buddhist figure commonly known as the “mercy goddess” (a female incarnation of a bohhisatva), so Tieguanyin is sometimes known as “Iron Goddess” tea. Tieguanyin is a premium semi-fermented (Oolong) tea that originated in Fujian province about 200 years ago. The complex method of processing Tieguanyin tea was a closely guarded secret for a long time. It is another one of the ten Famous Teas of China, and can be very expensive. Apparently one variety (there are many) once sold for $3,000/kg! Tieguanyin is very popular, so I’ve tried it many times in different places. The type I have is a “Jade” Tieguanyin, which is lightly baked, and known for having a floral scent and a flavour nearer to an unfermented (green) tea than a classic semi-fermented (oolong). At the tea party, people who liked Tieguanyin most were already familiar with Chinese tea and accustomed to the “green” flavour. Tie Guan Yin tea I brought to the tasting – dry leaves, steeped 10 minutes, steeped 20 minutes, and the leaves after steeping. Osmanthus Oolong tea – dry leaves, steeped 10 minutes, steeped 20 mintues, and the leaves after steeping. Snow Dragon Tea is grown at high altitude in the mountains of Southern Yunnan province and harvested during frosts of early Spring. Only the youngest buds and leaves are picked. They are usually downy, sometimes white, and can be frost-spotted. The type of leaf is similar to a white tea, but they are then pan fried like a green tea. The result is a pale yellow coloured tea with a flavour somewhere between a typical white tea and a typical green tea. High quality Snow Dragon teas are hand-rolled leaf by leaf into curly spirals – like a dragon tail (hence the name). My snow tea isn’t like that, but the leaves do have an interesting look – a silvery colour and a unique texture. I bought it in a teahouse outside Dali in Yunnan province while travelling with my parents. It was one of the most popular teas at my tea party, and several people remarked on the interesting sweetish aftertaste it leaves on the tongue. Snow Tea from Dali, Yunnan province – dry leaves, steeped 10 minutes, steeped 20 minutes, and the leaves after steeping. I also shared a White Tea (白茶 bái chá), a Rose Tea (玫瑰花茶 méi guī huā chá), and a Blooming Tea (开花茶 kāi huā chá), all of which were well-received. The White Tea was several people’s favourite. Ruth said it was “subtle and relaxing”. I was surprised at how popular the Rose Tea was, although I shouldn’t have been – I love it myself. I think we probably went through more Rose tea than anything else, although it’s a close call! The Blooming Tea I had was a simple one, a single flower (I think clover, perhaps a chrysanthemum) wrapped with low grade green tea leaves, so not the best flavour (one friend said it tasted like “dirty water” and I couldn’t fault her for it!) Still, it was really fun to watch the ball of tea leaves unfurl to reveal the flower – especially in the clear glass teapot I’d borrowed. We actually did a second blooming tea later in the afternoon so another group of people could enjoy the viewing fun. Rose Tea I used for the tasting – dry rose buds, steeped 10 minutes, steeped 20 minutes, from above, and the roses after steeping.